Thursday, May 3, 2018 (May the 3rd, with Mayzie LaBird) The BIG Day Of Giving is an annual fundraising event held for non-profit organizations in the greater Sacramento area. It gives donors a chance to show their community pride and support the nonprofits that are working hard to make our region great. There are also many donation matching opportunities and non-profit organizations have chances to win additional donation awards based on different criteria such as number of donations recieved and donation matching. DMTC is proud to be a part of the BIG Day Of Giving and we hope you will support us. But at DMTC the BIG Day Of Giving is not just about us asking for money. At DMTC we also have a full day of events you can come participate in. In 2016, our BIG Day Of Giving celebration was Scottish themed to complement our two productions that were being performed at the time: Brigadoon and Shrek. We had a full day of games, events, performances by our actors, and food in our lobby - even a pie eating contest. Despite technical difficulties from the BIG Day Of Giving website, we still met our goal and raised over $30,000 - Thank You! The BIG Day Of Giving is held on the first Thursday in May, so mark your calendars, and come join us. We appreciate your support! 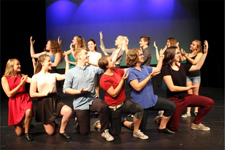 Davis Musical Theatre Company's Young Performers' Theatre Division, presents their annual TEEN CABARET and Dessert Fundraiser each summer. The Teen Cabaret is an opportunity for the theaters' teen actors and dancers to create, arrange, and choreograph their own cabaret style show. The show also helps to fund DMTC's Theater Arts Award for graduating Seniors. The high energy show includes a wide variety of performances including solos and duets of musical theater standards and large ensemble song and dance numbers. Complimentary desserts are served after the performance, while beverages are available for purchase. All proceeds benefit the Theater Arts Award for graduating Seniors. 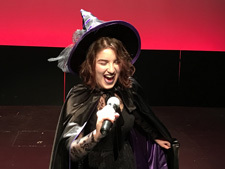 Get ready for spook-tacular fun at Davis Musical Theatre Company's annual Halloween event. Each year DMTC creates a thrilling Halloween themed experience you won't want to miss! A hauntingly chilling evening of killer karaoke with a frighteningly long song list (over 500 songs!). Costumes contests with prizes. Sinfully delicious drinks and desserts, and a no host bar. Recommended for all ages, however 13 and under must be accompanied by an adult. In 2016 DMTC held it's first annual Monopoly tournament. Do you love Monopoly? 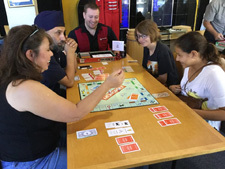 Then join Davis Musical Theatre Company for a Hasbro-sanctioned Monopoly Tournament! Open to all ages, compete for prizes and bragging rights! If you have other ideas on fundraising events, we would love to hear from you. Please send an email to our volunteer coordinator at volunteer@dmtc.org.